Proud member of the long-term investors club? If you don’t do anything about it, then you’re sure a loser every year because of the losing purchasing power of your money at hand. More importantly, you simply can’t overstay in the stock market or invest blindly and hope you are up after 5 years. Stocks that keep on going down even if you keep it for several years are not unusual! Take a look at stock MEG as an example. The chart is shown below. If you invested your life savings blindly that 2007, I don’t think you’ve had a good night sleep. 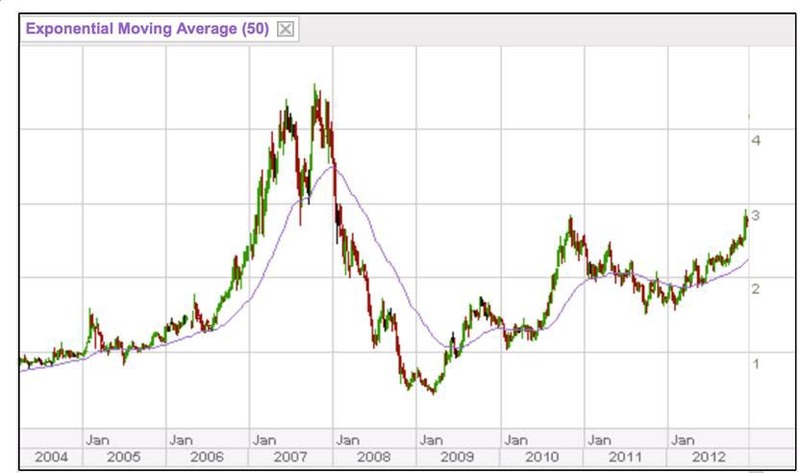 Until after around 7 years, it still did not break the 2007 highs. (Now as of April 29 2015, its current price is only at 5.33). Short, mid and long-term investing all have pros and cons, which any one investor should be aware of. Again, if you go long-term, then the key is on choosing the companies that will have consistent growth earnings. COL Financial even shared some studies that if you do long-term using Peso Cost Averaging, then carefully chosen individual stocks could give you 10-20% annual returns in 20 years span. If there are people playing with resistance and support, that’s because it’s their chosen style. They decided to be active players, something you don’t really need to imitate if you’re not that type. (In case you wanna explore this possibility of earning more, you can check out my highly recommended Full Trading Course here, where you can equip yourself with comprehensive Technical Analysis.). But then, market goes in cycles, which means theoretically if you want to maximize your returns, you should at least sell at the peaks of bull cycles and buy at the bottoms of bear cycles. The subject of technical analysis can help you recognize those market phases, something much easier said than done. In the end, if you think of it, the price of the stock is the real king. Whether long- or short-termer, you’ll earn capital gains ONLY when you sell at a higher price than you bought it. If you’re able to time the bottom of the market, that I believe is the best scenario you can ever have in multiplying your money through stocks. So… are you also going for long-term? Why or why not? PS: Learn more about Technical Analysis, Market Timing and Portfolio Management.